On all models except Wrangler, front suspensions consist of axle, 2 coil springs, track bar, stabilizer bar and upper and lower control arms. Track bar is used to minimize front axle side-to-side movement. Stabilizer bar and shock absorbers control suspension spring movement. Wrangler models use leaf spring front suspension with shock absorbers, stabilizer bar and a track bar. NOTE: See SPECIFICATIONS & PROCEDURES article in WHEEL ALIGNMENT. NOTE: Wheel bearings on all 4WD models are nonadjustable. If wheel bearings require service, see WHEEL BEARINGS under REMOVAL & INSTALLATION. detected proceed to WHEEL BEARINGS under REMOVAL & INSTALLATION. Remove wheel and tire assembly. See Fig. 1. Fig. 1: 2WD Hub/Rotor Assy. Courtesy of Chrysler Corp.
seal from hub. Remove inner wheel bearing. compressed air. Damage to bearings or serious injury could occur. Clean bearings and hub in solvent and dry with compressed air. Inspect bearings and races for damage or excessive wear. separately. If defective, hub and bearing must be replaced as an assembly. See HUB & BEARING under REMOVAL & INSTALLATION in FRONT AXLES article in DRIVE AXLES. With vehicle at normal ride height, remove nut, washer and rubber grommet from top of shock absorber. Raise and support vehicle. Remove lower shock mounting bolts from axle housing bracket. Remove shock absorber. Inspect units for damage or leakage. To install, reverse removal procedure. AXLES article in DRIVE AXLES. NOTE: DO NOT disconnect caliper unless service is needed. Support caliper with wire to prevent hose damage. shaft from right axle tube. Leave shift collar on intermediate shaft. On all models, remove caliper anchor plate from steering knuckle. install nuts. Tighten nuts to specification. Install NEW cotter pins. Install caliper anchor plate and tighten bolts to specification. See TORQUE SPECIFICATIONS TABLE at the end of this article. Install axle shafts into axle tubes. completely engaged with shift collar. bolts. Install hub washer and nut. Tighten hub nut to specification. caliper and wheel. Lower vehicle. Fig. 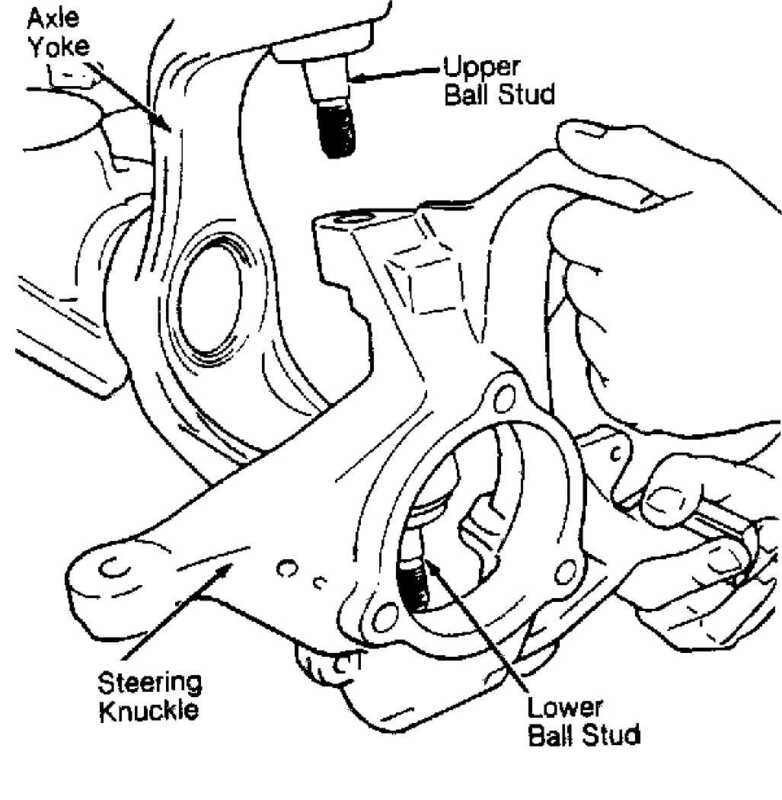 2: Removing & Installing Steering Knuckle Assembly Courtesy of Chrysler Corp.
1) Raise and support front of vehicle. Note sensor wire routing for installation reference. Clean area around sensor to prevent damage during removal. Remove wheel speed sensor from steering knuckle. Unseat sensor wire retaining grommet. 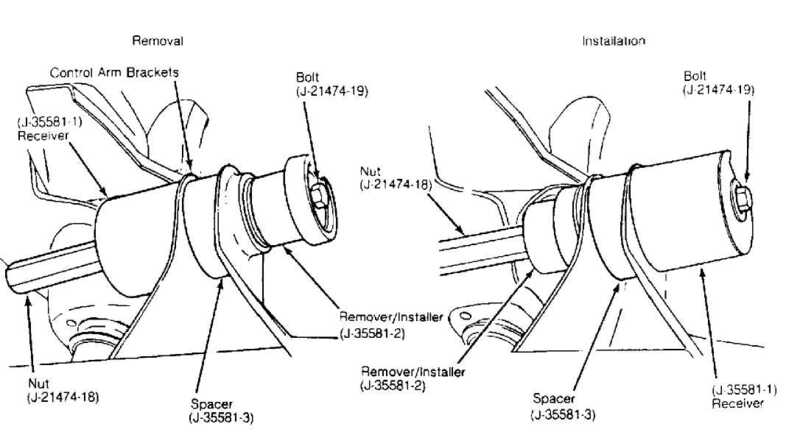 2) Inside engine compartment, unplug sensor connector from anti-lock harness connector. Remove sensor. To install, reverse removal procedure. See Fig. 3. 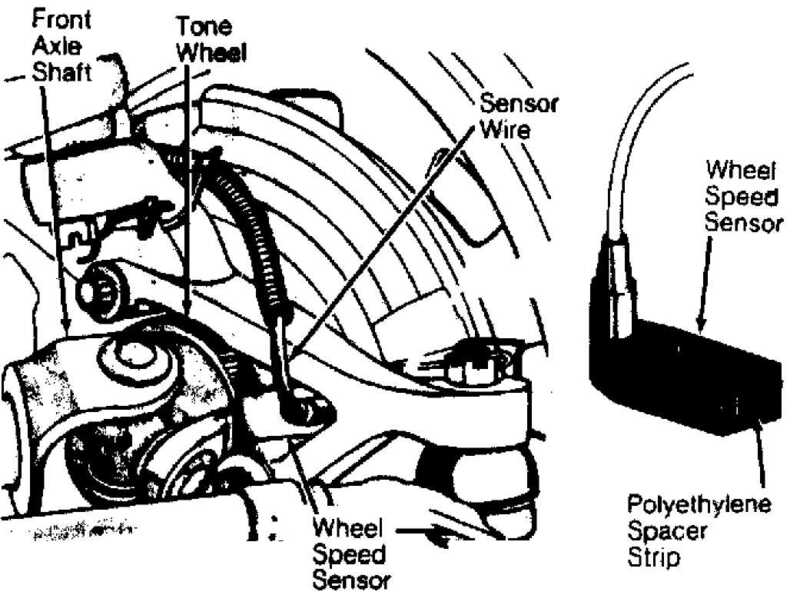 Air gap between ABS wheel speed sensor and tone wheel is not adjustable. Fig. 3: Locating Anti-Lock Brake Wheel Speed Sensor Courtesy of Chrysler Corp.
1) Remove steering knuckle assembly. See STEERING KNUCKLE. To remove upper ball joint, install Receiver (J-34503-1) over top of upper ball joint. Place Adapter (J-34503-3) in "C" clamp. Install "C" clamp, adapter and receiver. Tighten "C" clamp screw to remove ball joint. See Fig. 4. Fig. 4: Removing & Installing Ball Joint Courtesy of Chrysler Corp.
2) To remove lower ball joint, position Receiver (J-34503-1) onto "C" clamp and Adapter (J-34503-3) at base of clamp. See Fig. 4.Install "C" clamp, adapter and receiver. Tighten "C" clamp to remove ball joint. See Fig. 4. 34503-12) and "C" clamp. Tighten "C" clamp and fully seat ball joint. "C" clamp to install ball joint. Ensure ball joint is fully seated. axle flanges. Disconnect drive shaft at front axle. bar at frame rail bracket. Disconnect tie rod from pitman arm. spring retainer mounting bolt. Remove spring retainer and coil spring. height. See TORQUE SPECIFICATIONS TABLE at the end of this article. from axle housing. Disconnect control arm mounting bolt at frame rail. NOTE: Spacer (J-33581-3) is not used on 4WD models, as solid control arm brackets are used. DO NOT attempt to remove upper control arm pivot bushing on 2WD models without spacer. Axle bracket will be distorted if spacer is not used. Fig. 5: Removing & Installing Upper Control Arm Bushing Courtesy of Chrysler Corp. CAUTION: On 2WD models, spacer must remain installed for bushing installation. bracket. Assemble remaining installer components. See Fig. 5.
install upper control arm, reverse removal procedure. Raise and support vehicle. Support axle. Disconnect lower control arm mounting bolts at axle housing and frame brackets. Remove lower control arm. To install, reverse removal procedure. nut at frame rail bracket. Remove track bar-to-axle housing bracket. stabilizer bar links. Remove stabilizer bar bracket-to-frame bolts. Remove brackets. Remove stabilizer bar and bushings. (if removed). Tighten to specification. Install stabilizer bar and brackets on the frame. DO NOT tighten bolts at this time.